The mainstream press is tipping its glasses in exultation over the latest regulatory conviction in the anti-Trump, anti-Russia brouhaha. This one comes in form of a upcoming guilty plea by a 28-year-old Russian woman named Marina Boutina. Her crime? Failing to register as a foreign agent of the Russian government. Pardon the Red slip but all this anti-Russia brouhaha really does remind me of the Cold War, when the U.S. national-security establishment was warning Americans of the danger of communist infiltration within our nation. The main danger, the Pentagon, the CIA, and the NSA maintained, was that posed by the Soviet Union, of which the principal member was Russia. Yes, that Russia, the same country that Butina is alleged to be a secret, unregistered agent for! America, people were told, was faced with a worldwide communist conspiracy to take over the federal government and the rest of the world, a conspiracy that was supposedly based in Moscow. Yes, that Moscow! The capital of Russia! One of the interesting aspects of all this is how Russia’s strategy to supposedly take over America has shifted since the Cold War. Back then, the strategy was supposedly to conquer us by force by causing the dominoes to falling places like Korea, Vietnam, and Cuba. The final big domino was going to be the United States. Today, on the other hand, the Russian strategy is obviously to try to make friends with the United States, just as Kennedy was trying to do with Russia when he was assassinated. In dating a GOP operative, making contacts with conservatives, and attending conservative conferences, Butina was clearly part of this nefarious plan on the part of Russia to befriend the United States. But here’s my question: Why is dating a Republican, attending conservative conferences, and making contacts with conservatives and members of the Trump administration a criminal offense here in the United States. Aren’t such activities protected by the First Amendment to the U.S. Constitution? After all, we are clearly talking about actions that involve freedom of speech and freedom of association. Before anyone says that Butina is a Russian and, therefore, isn’t entitled to exercise such rights here in the United States, let’s remind ourselves of what our Declaration of independence states: that all people, not just Americans, are endowed with fundamental, God-given rights with which no government can legitimately interfere, not even the U.S. government. Okay, you might say, but Butina isn’t being convicted of doing those things. Why, she’s not even being convicted of spying, which is what the mainstream press continues to allege about her nefarious dating, contacts, and conference activities. She’s being convicted of failing to register as a Russian foreign agent. Now, this might shock you and maybe even scare you, but under U.S. law it’s not illegal for Butina or anyone else to be an agent of the Russian government. It’s only illegal to fail to sign an official U.S. government registry disclosing that a person is acting as an agent for the Russia government (or any other foreign government). Is that not sort of weird? In other words, it’s legal for a Russian to befriend the United States, including lobbying the president and the members of Congress. But the person doing the befriending is simply required to sign an official U.S. registry indicating that he or she is acting on behalf of the Russian government. 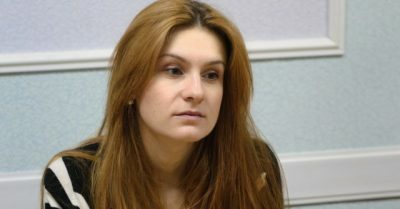 But given that everyone, including Butina and every other Russian, has the fundamental, natural, God-given rights to engage in freedom of speech and freedom of association, then why in the world must she register in order to exercise such rights? Doesn’t a registration requirement convert these rights into privileges rather than rights? It turns out that this foreign-registration law, not surprisingly, was enacted in 1938 by the Franklin Roosevelt administration, no doubt as part of FDR’s welfare-warfare state revolution that he was implementing in the United States. At that time, federal officials were inculcating a fear of Nazi Germany into the American people and, ironically, a mindset of friendship toward Russia and the rest of the Soviet Union into the American people, who were strongly opposed to entry into World War II. Ironically, after FDR succeeded in pulling the U.S. into the war, his successor President Truman succeeded in making Hitler’s wartime enemy and America’s wartime partner, the Soviet Union, into America’s postwar official Cold War enemy. Thus, that was what the Cold War was all about — keeping Americans afraid, very afraid, that the Russians were coming to get them. That deep fear lasted until 1989, when the Soviet Union unilaterally and surprisingly ended the Cold War, thereby depriving U.S. officials of their longtime scary bugaboo. After that, the official enemy became Saddam Hussein, and then terrorists, and then Muslims, and, to a certain extent, illegal immigrants. But now we have come full circle, with Russia once again an official enemy of the United States. No, there has been no law enacted to that effect. And no, there has been no official declaration of war against Russia. But the Pentagon and the CIA have made it clear, especially through the mainstream press, that Russia is to be considered, once again, an official enemy of the United States. Maria Butina’s conviction for befriending the United States without having first registered her name with U.S. officials confirms that.